Heuchera is a Native American perennial plant that is found all over the country. 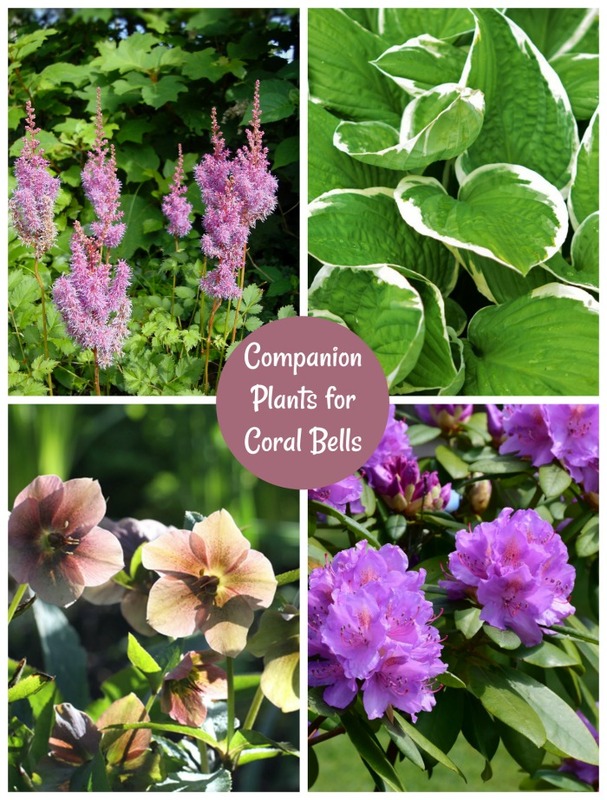 It is more commonly known as Coral Bells and comes in many shades of purple, rose, green and variegated varieties. The plant makes a wonderful display in any shade garden and, although it does flower, it is grown more for the foliage. I have several varieties growing in the shady spots in my garden beds. Heuchera is popular because it is easy to grow, adaptable and looks great. It is also hardy to zone 4 and considered to be somewhat deer resistant, which is a plus if you have deer that wander into your gardens. One of the things that I love about them is that they grow beautifully in a shade garden on the north side of my house that gets very little sun. They even flower in this spot! 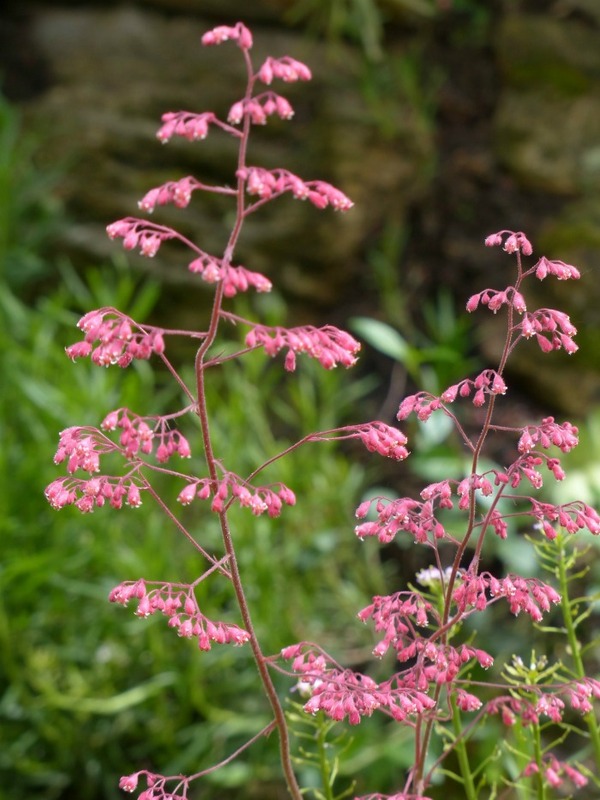 If you have a shady garden spot, be sure to give coral bells perennial a place in it. 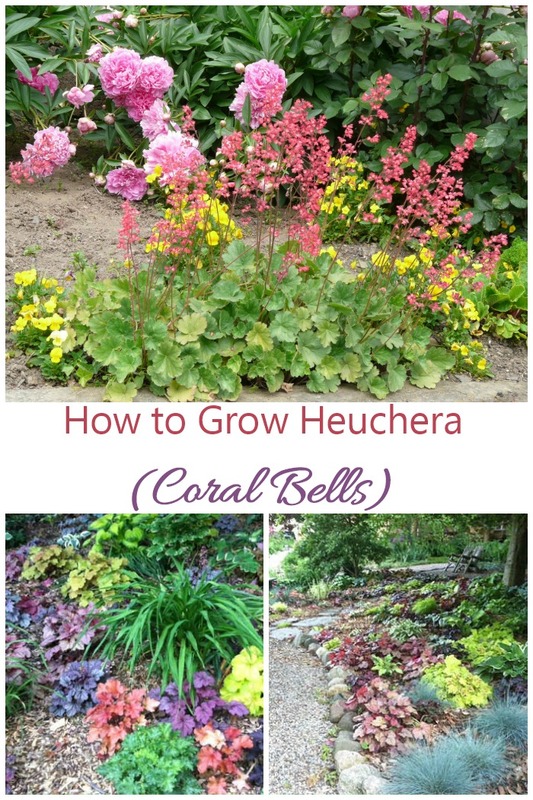 These tips for heuchera care will make sure that your coral bells plants will give you pleasure for years to come. Heucheras are fairly forgiving when it comes to sunlight. The plant can take full sun and partial shade. Depending on your zone, you may need to protect it from the harshest summer rays. I live in North Carolina and find that my plants to best with filtered sun and light shade. This brings out the color in the foliage the best. Even though coral bells can take full sun, harsh sun can wash out the color of the leaves and too much sunlight can also cause the edges of the leaves to scorch. Since the plant is normally a woodland plant, it’s happiest in light shade. How much water does coral bells need? 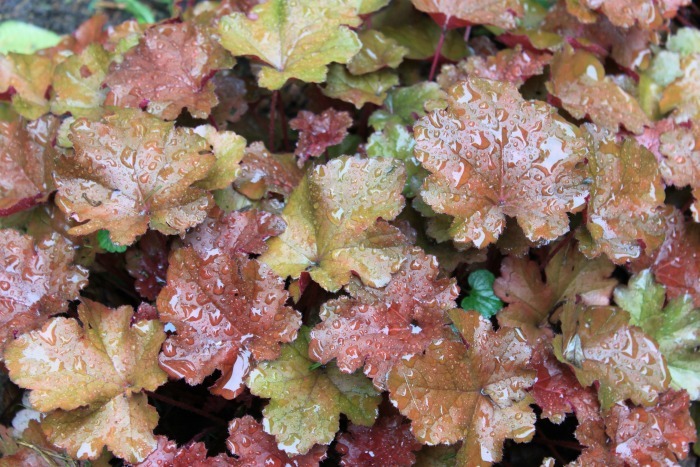 Heuchera prefers a moist soil condition. It will do well with about an inch of rain during the growing season. If you get less rain than this, your plants will be happiest if you give them additional water. But once again, the plant is forgiving. This is the reason that I prefer to place my coral bells in a shady spot. It makes managing the water an easier task. In nature, the plants grow in woodland settings. Often they will root along steep slopes which offer the plant good drainage. This gives an indication of the type of soil that we should use for coral bells. A good well draining soil works best for heuchera. 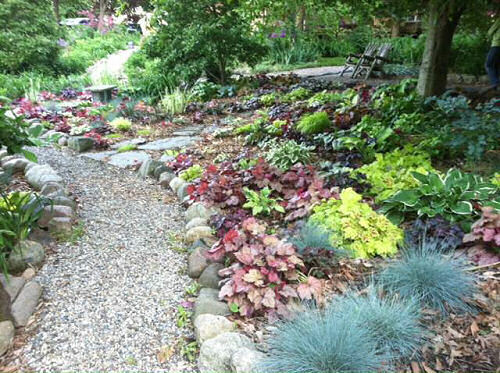 Adding compost to the soil when planting coral bells and again in the spring will help with drainage. 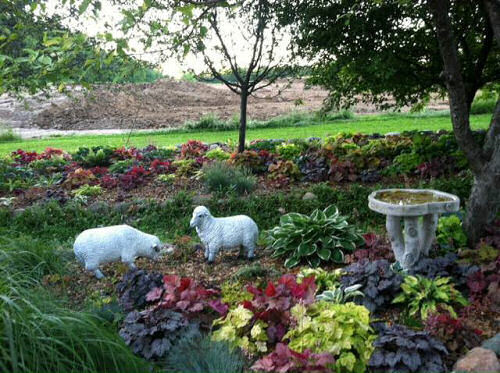 Mulching around (but not too close to the crown of) heuchera also helps to conserve moisture. How large do Coral bells get? The size of mature plants is about 12-18″. You can use the plants in clusters to give garden interest. 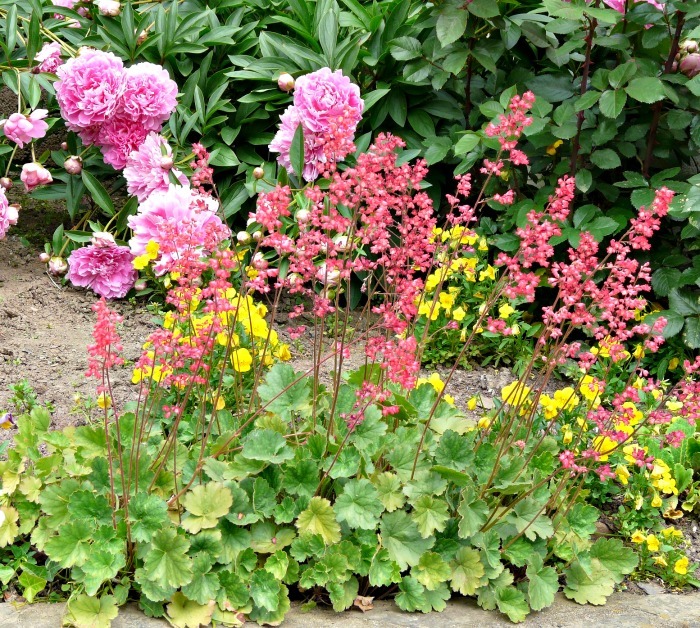 This Heuchera Creme Brulee is a very mature plant that has multiplied to appear much larger. Their size and foliage colors makes them good edging and planter specimens and planting them in groups will make the plant appear larger and will make a good back drop for other flowering plants. Heuchera perennials are grown mainly for their beautiful foliage. 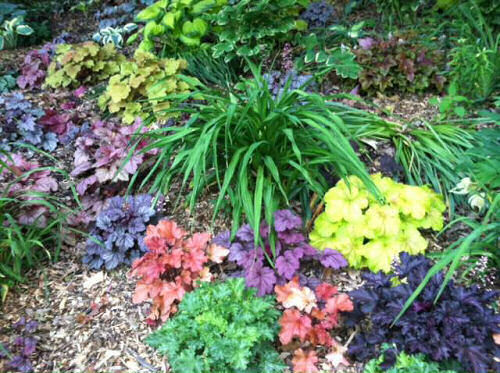 The many varieties of coral bells come in shades from brown, green, chartreuse, purple, bronze through to red. The leaves of some varieties (like this Heuchera Green Spice) have a bi-color look to them that is very appealing. Even though we plant coral bells for the plant’s foliage, it does produce flower stalks. The flowers grow on long stems which lover able the foliage. While the flowers are not as impressive as the leaves, they do add a bit of interest to the garden and can be quite colorful. They are small and popular with hummingbirds. Bloom time is late spring to early summer. Plants grown in a shady spot may not flower as well as those that get a decent amount of sunlight. Heuchera can be grown from seed but the plant may not look like the parent. To get a plant with the same characteristics as the mother plant, you can take root cuttings, or pot up the babies that will grow near the base of the parent plant. Mature heuchera perennials will grow into quite a large clump. It is best to divide the parent plant every 3-4 years to keep the mother healthy and vibrant. To divide coral bells, dig up the clump and separate the individual plants, keeping as much root as possible with each plant. 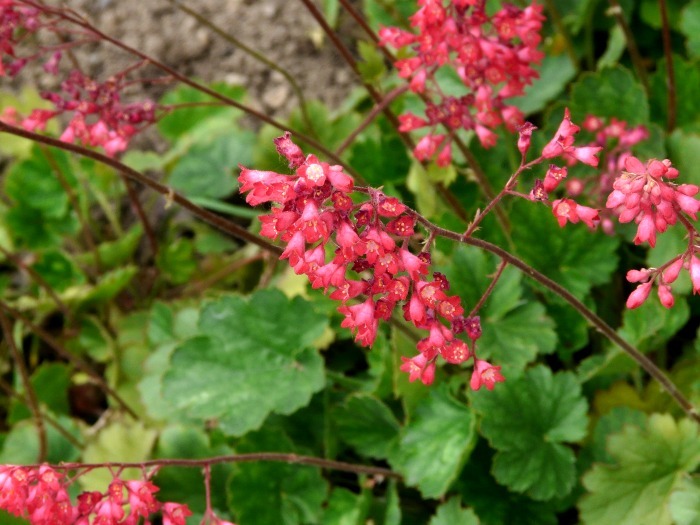 The best time to divide coral bells is in the early spring or fall months. The plant is cold hardy in zones 4-8. The plant is evergreen and keeps it’s foliage color all year long. 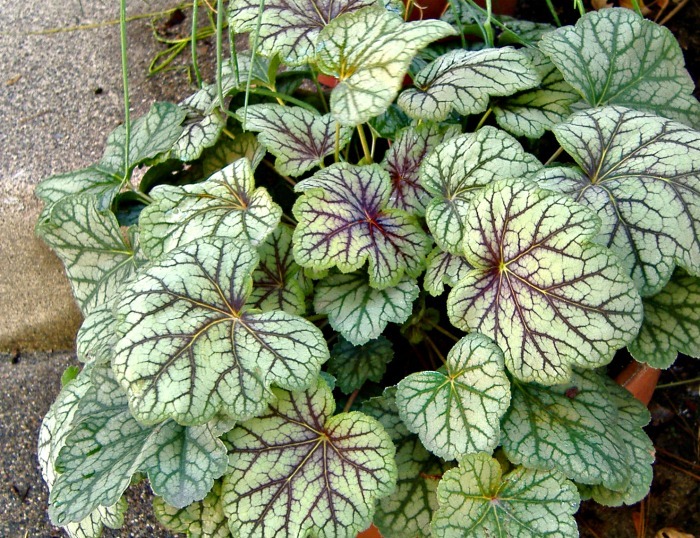 Heuchera Palace Purple – deep bronze leaves. Heuchera villosa – Pale yellow green leaves. Heuchera Caramel – the autumn colored leaves make it great for fall planting. 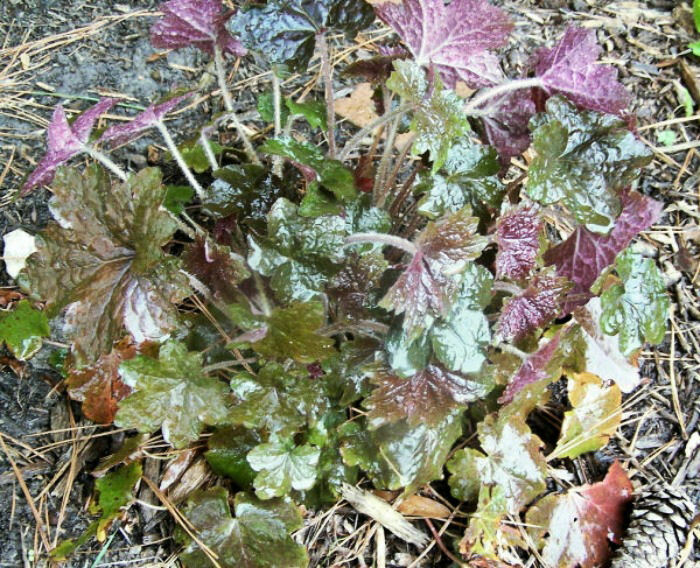 Heuchera obsidian – purplish black leaves. Here are some additional photos of Coral bells taken by Janie Newton Teel on a Garden Tour of Stott Garden in Goshen Indiana. Heuchera is a real feature of these gardens. I love all the varieties of coral bells that they have growing! 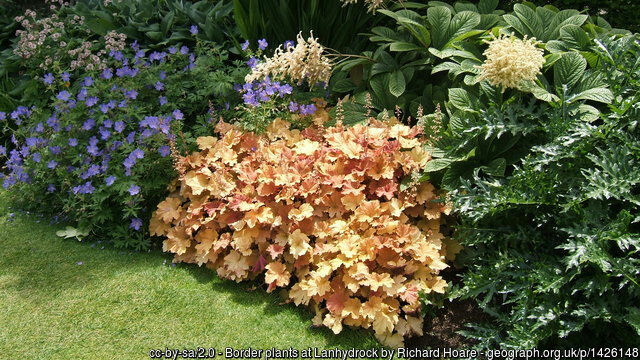 Every garden can be made more beautiful with the addition of Heucheras and this is the year for you to add some to your garden. Do you have one in your garden? To remind yourself of care tips for coral bells, pin this image to one of your gardening boards on Pinterest. Admin note: This post first appeared on the blog in April of 2013. I have updated the post to add additional information, more photos, a printable care card and a video for you to enjoy. 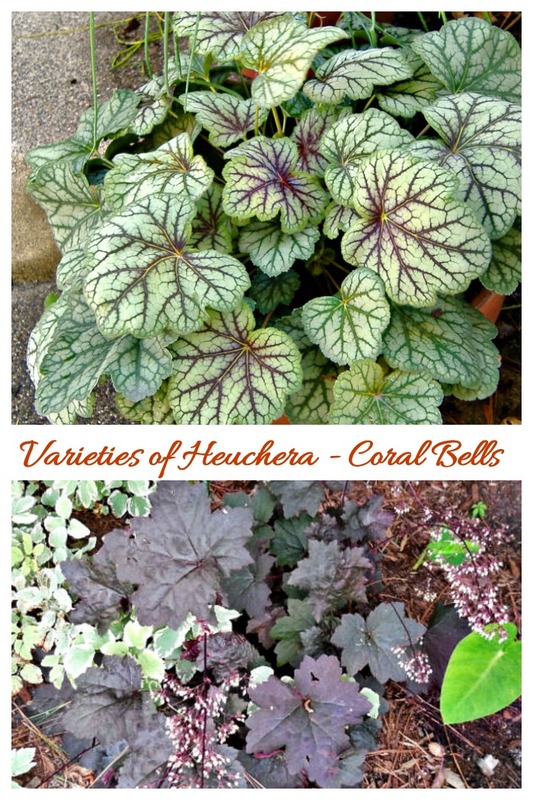 Heuchera is also known as coral bells. It is a perennial plant that is evergreen with beautiful foliage. Print out this card so that you have care tips for coral bells handy. Propagation: By Division. Seeds don't grow true to parent. ← Bonsai Garden – Bonsai Tree Care – Small Trees – Big Impact! Heuchera are commonly used as accent or specimen plants, in woodland gardens or rock gardens, and as groundcovers or mass plantings. It also attracts butterflies and hummingbirds into the garden. If you are also looking for gardening ideas to help improve your garden and outdoor space, just click here. I like your post, you define fundamental of huecheras. I like your post, I appreciate your work. I have Heucheras growing in pots. I live in a subtropical area and the days can be very hot, like today and yesterday at 38degrees. But they do well in a shaded area under an olive tree.